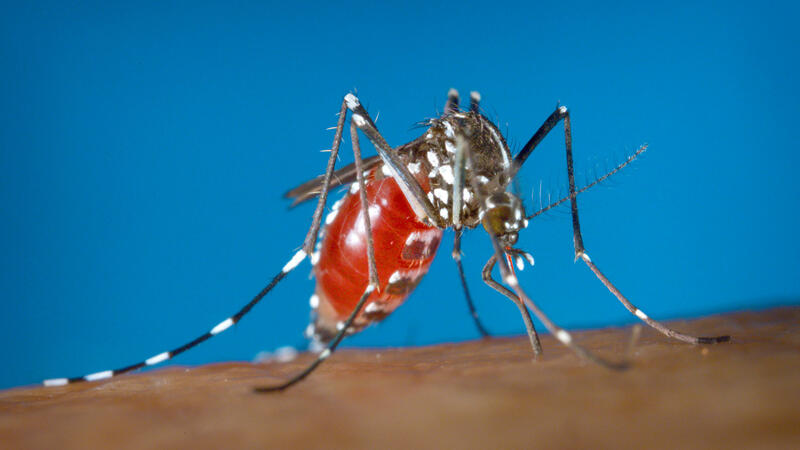 The people-plaguing Asian tiger mosquito, or Aedes albopictus, typically lays its eggs in stagnant water. A simple trap known as a GAT may help neighborhoods get rid of the Asian tiger mosquito, an aggressive biter. The trap doesn't look particularly impressive — it's basically three plastic buckets stacked together. The top and bottom buckets are black. The mosquitoes fly into the trap through a hole in the top bucket, but they seem to have a hard time flying back out through the hole. 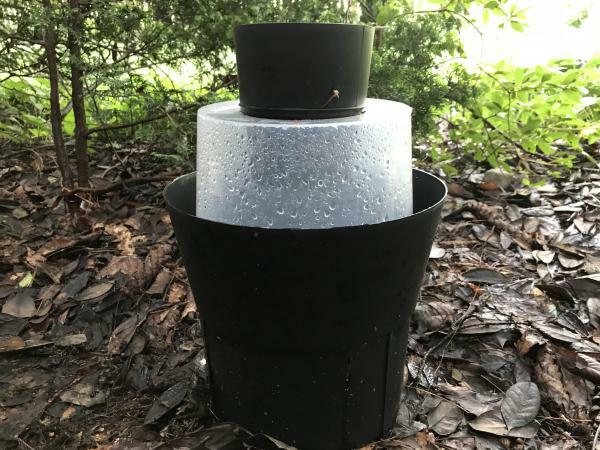 To make matters worse (for the mosquito) you can dangle a piece of sticky paper inside the top bucket to catch a wayward pest that happens to land there. The bottom bucket contains water with some rotting grass floating in it. Aedes mosquitoes typically lay their eggs in stagnant water. The middle bucket has a net to trap any mosquitoes that hatch in the water. It's a simple setup, but the scientist who invented the GAT, Scott Ritchie of the Australian Institute of Tropical Health and Medicine at James Cook University, says there are several reasons it's effective. "Most mosquitoes are innately attracted to black," Ritchie says, so that's what lures them in. Female mosquitoes are the ones that bite people, and once they're stuffed with blood, they're eager to lay eggs. "So we've got the blackness that brings them to the trap, and then we've got the stagnant water actually inside the trap where they can't escape," Ritchie says. "If you trap out enough of the egg-laying mosquitoes, then there aren't going to be eggs in the wild, so the population will crash." But the traps alone aren't enough to get rid of the pesky mosquito. Ritchie says it's important for homeowners to eliminate any pools of standing water. Abandoned tires, for example, are notorious for collecting water after it rains, but even an inverted bottle cap can hold enough water for an Aedes mosquito to lay her eggs. There's one other key to controlling the mosquito population in a community: Everybody has to pitch in. If your neighbors don't use the traps and remove standing water, then mosquitoes are likely to thrive and won't mind flying over to your yard for a snack. But there is some good news. "These mosquitoes don't fly very far," says Dina Fonseca, a mosquito expert at Rutgers University. "So basically if you have most of your neighbors employing this approach and aware of what they need to do to control this mosquito, you're in good shape." Then she adds with a smile, "It does require talking to the neighbors." There's already some scientific evidence that the traps can be effective. Fonseca is working with several communities in and around Washington, D.C., to see if the control program is effective. Anecdotally, residents tell her the number of mosquito bites has gone down in areas where people are using the traps and eliminating standing water. The scientific proof is still a ways off. A scientific experiment is going on that could bring people who love backyard barbecues some joy. Scientists think they found a simple way to control mosquitoes. The approach involves two things - a decidedly low-tech mosquito trap and getting to know your neighbors. NPR's Joe Palca reports. JOE PALCA, BYLINE: The front, back and side yards surrounding Kit Gage's suburban home just outside Washington, D.C., can rightly be called lush. There are camelias, ferns, rhododendrons and lots more. There are also three mosquito traps called GATs. KIT GAGE: One is hiding underneath a camelia. PALCA: GAT stands for gravid Aedes trap. Aedes refers to the Asian tiger mosquito the trap is designed to catch. The Asian tiger is a real pest. It bites aggressively night and day. As we walk through the backyard, Gage tips over a barrel to drain a pool of water that has formed on top. So wait a minute. Why did you just do that? GAGE: Water collects on this composter, and I remove it every time it rains. PALCA: Aedes mosquitoes like to lay their eggs in standing water. Any puddle will do. So removing puddles is key to controlling the mosquito. There's another trap at the back of the yard. GAGE: Third one's over here under the big beech. PALCA: The top and bottom buckets are black. There's a hole in the top bucket where the mosquitoes can fly in. The bottom bucket contains water with some rotting grass floating in it. The middle bucket has a net to trap any mosquitoes that hatch in the water. Simple, but Scott Ritchie says there are several reasons why it's effective. SCOTT RITCHIE: Most mosquitoes are innately attracted to black. PALCA: Ritchie invented these traps. He's at James Cook University in Australia. Now, it's female mosquitoes that do the biting. And once they're stuffed with your blood, they're ready - nay, eager - to lay eggs. RITCHIE: So we've got the blackness that helps bring them to the trap. And then we've got this stagnant water that helps bring them actually inside the trap where they can't escape. RITCHIE: If you trap out enough of the egg laying mosquitoes, then there aren't going to be eggs in the wild. And so the population will crash. PALCA: That's the theory anyway. Mosquito researcher Dina Fonseca from Rutgers University is aiming to see if it works in practice. ANDRE FONSECA: One through four and six. PALCA: Fonseca and her son Andre are checking the yards in Kit Gage's neighborhood to see if the mosquito population is really declining. Many of the residents here have the GAT traps and are trying to eliminate puddles of water. D. FONSECA: These mosquitoes don't fly very far, so basically if you have most of your neighbors employing this approach and aware of what they need to do to control this mosquito, you're in good shape. But it does require talking to the neighbors. PALCA: Talking to the neighbors is something Kit Gage is good at, and she gets the concept. GAGE: It's not enough that I have three traps in my yard. I have to make sure that Lisa next door and Bobby on the other side and Tricia across the street - that they have traps, too. PALCA: It's going to take a while to get the scientific data to show the traps are working. Anecdotally, Kit Gage says this year, she's getting far fewer bites than last year. Joe Palca, NPR News, Silver Spring, Md. Transcript provided by NPR, Copyright NPR.